Shibaura mdl. BT-10AP Horizontal Boring Mill s/n 661. Thermotron mdl. SMX-35-5-5 35-Cu/Ft Temperature Humidity Chamber s/n 17269. Thermodynamic mdl. 8599IO Oven to 600 Deg F s/n 869. Bemco mdl. AF400-125 Vacuum Oven s/n 2955. Trane mdl. CVHE250 “CenTraVac” Water Chiller. 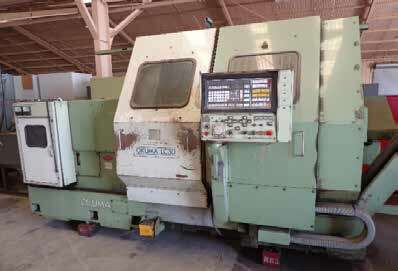 Okuma mdl. LC30 CNC Turning Center s/n 0275 w/ Yasnac Controls, 12-Station Turret, 2500 RPM, 10” 3-Jaw Chuck. 1984 Mitsubishi mdl. M75 CNC Die Sinker EDM Machine s/n 04756110 w/ Mitsubishi Controls, C6G120 Power Source, Micro Separator Filtration System. Buehler mdl. 10-1000 Wet Saw. 1996 Atkinson 8’ x 12’ Portable Office w/ 1996 Piller “Apostar” mdl. AS50 50kVa UPS Power System s/n A547-1 480V, 85Amp, InstaPack Battery Storage Cabinet, AC. Kohler mdl. 350ROZD71 350kW Diesel Generator s/n 339343 w/ Detroit Diesel Engine, 438kVa, 526 Amp @ 277/480V, 211 Metered Hours. 2000 Caterpillar mdl. 3412 750kW Diesel Generator s/n 2WJ05903 w/ Cat Twin Turbo Diesel Engine, 938kVa, 480V, 1130Amps. LeBlond mdl. 2013 Heavy Duty Sliding Gap Bed Lathe s/n 4NE-1535 w/ 16-2000 RPM, Inch Threading, Taper Attachment, Tailstock. Harrison 21” x 60” Geared Head Gap Bed Lathe s/n 146699 w/ 3 ½” Thru Bore, 19-1500 RPM, In/mm Threading, Tailstock, Steady Rest, 16” 3-Jaw Chuck. LeBlond Regal “Servo Shift” 15” x 54” Lathe s/n 15C-181 w/ 45-1800 RPM, In/mm Threading, Tailstock, 10” 3-Jaw Chuck. 5C Collet Closer, 8” 3-Jaw Chuck. Tailstock, 5C Collet Closer, 8” 3-Jaw Chuck. Acra-Mill mdl. AM2S Vertical Mill s/n 050645 w/ Newall DRO, Chrome Ways, Power Feed. Bridgeport Vertical Mill s/n 256244 w/ Sony DRO, Power X & Y Feeds, Power Draw-Bar, Chrome Ways. Bridgeport Series 1-2Hp Vertical Mill s/n 225555 w/ DRO, Power Feed. Bridgeport Vertical Mill s/n 99515 w/ 1Hp Motor. Milwaukee mdl. 415 TF Series “Ram Head” Universal Mill s/n 1030R. Milwaukee mdl. H Horizontal Mill s/n 35-3754. Wilton mdl. 8120 Vertical Band Saw. Powermatic mdl. 66 Table Saw w/ Fence and Support Tables. Forklift Rotator and Barrel Grabber. Beach-Russ Co. 20Hp Vacuum Pumps. Tennsmith mdl. H5216 52” x 16GA Power Shear s/n 15881. Victor mdl. 1630B 16” x 30” Geared Head Gap Bed Lathe s/n 29061300 w/ In/mm Threading, Tailstock, 5C Collet Closer, 8” 3-Jaw Chuck. Jet mdl. 1240PD 12” x 40” Geared Head Gap Bed Lathe s/n 7064 w/ 105-1800 RPM, In/mm Threading, Tailstock, 5C Collet Closer, 8” 3-Jaw Chuck. insert lower right corner of pic#0106 Acra-Mill mdl. AM2S Vertical Mill s/n 050645 w/ Newall DRO, Chrome Ways, Power Feed. Bridgeport Vertical Mill s/n 256244 w/ Sony DRO, Power X & Y Feeds, Power Draw-Bar, ccrome Ways. Clark ESM11-20 2270 Lb Cap Electric Forklift w/ Charger. Samuel mdl. SBC-932 Automatic Strapping Machines. ***1 of 4 Roland mdl. EGX-300 Desk Top Engraver. Coffing and CM Electric Hoists to 2-Ton Cap. Wysong mdl. 100 Ironworker s/n SW1-338 w/ Punch, Notcher, Angle and Bar Shears. Lista and Isles Work Benches. ***60 Available Lista Roll-Top Cabinet. Haskel mdl. 57210 8000 PSI Gas Pressure Booster s/n A6718. Over 100 Lista and Vidmar Tooling Cabinets. Industrial Machinery “Typhoon” Proceco mdl. Roland mdl. EGX-300 Desk Top Engraver. Lista and Isles Work Benches. (60 Available) Frontier 24,000 Lb Cap Bridge Crane w/27’ Approx Span. R & M “Spacemaster II” 10-Ton Cap Bridge Hoist (2)5-Ton Hoists. 1996 Atkinson 8’ x 12’ Portable Office w/ 1996 Piller “Apostar” mdl. AS50 50kVa UPS Power Nucon Systems Tanks.